As I am sure you are aware the Nordstrom Anniversary Sale is going on right now. (You can see our picks from the start of the sale here). The sale ends August 8, which means there is exactly 5 days left to shop. We have been noticing a handful of incredible Baby & Kids picks. Some that we swear by as moms and others that will help with back to school prep. Below is our last minute NSale picks for Baby & Kids. JU JU BE Legacy BFF Diaper Bag – I live and die by this diaper bag. With my first and for the first 8 months of my second’s life I used a large Marc Jacobs diaper bag tote. It was super cute, but this JU JU BE Diaper Bag changed my life. It is stylish, easy to see everything in your bag, and most importantly it can be worn as a backpack, saving your arms for corralling children. It’s that time of year again… the Nordstrom Anniversary Sale! You undoubtedly are aware by the mass amounts of coverage it gets from Bloggers posting on Instagram and writing blog posts about it. Well… We are no different!! We can’t help ourselves. It is the best sale to stock up on fall wardrobe staples and score on last minute summer staples (which still feels like a major win since summer is practically 8 months of the year here in Florida!). Below we both are sharing our top picks from the sale. *Currently it is only open to those that hold a Nordstrom Credit or Debit Card (if you shop here often they are definitely worth it – we grabbed one the last time my husband got a suit – highly recommend.) If you would rather not get one you can sign up for Nordstrom Rewards with your email and phone number which allows you to accrue points for every dollar you spend to earn a Nordstrom Note. That said, Early Access does not include Nordstrom Rewards Members, only Nordstrom Credit or Debit Card holders. You can still sneak a peak and look around, because the sale opens up to everyone on July 22! This week CO and I decided to focus on our Summer Style must haves. It is getting MUCH hotter (read UGLY HOT) in our neck of the woods, and all we can think about is how to dress as cool as possible (cool as in temperature and style 🙂 ). The perfect summer dress right here! This dress is the epitome of what summer style looks like to me. It’s high on my must have list. There’s not much else I can say about it! If you are looking for something similar but with a smaller price tag, JCrew Factory has a good alternative. 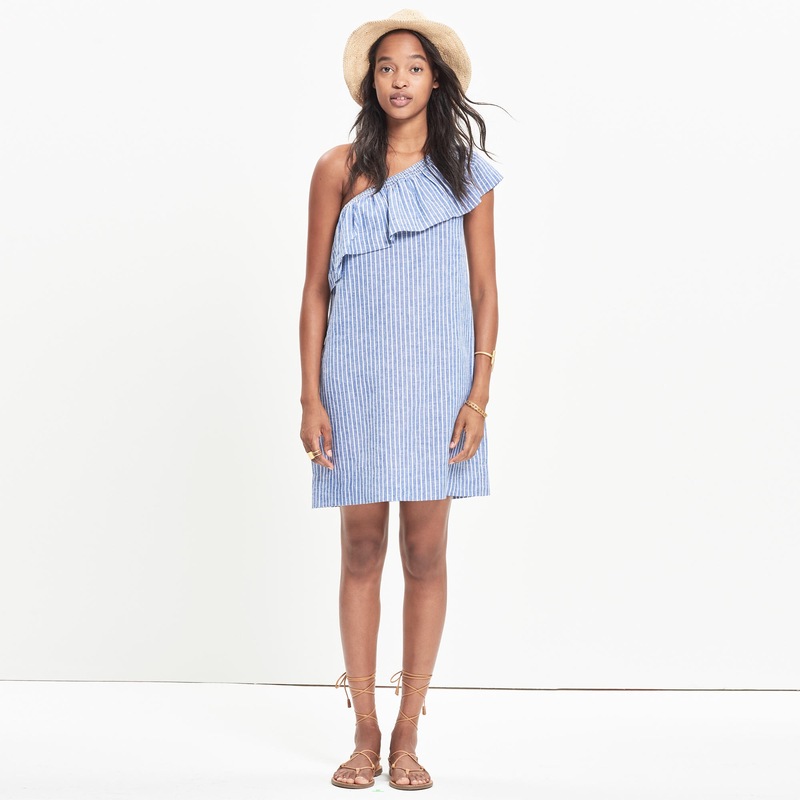 This Striped Chambray Ruffle-Neck Dress is just as cute, especially the cold-shoulder detail!